First Look at Shirtless Â?Wolf PackÂ? Members in Â?Twilight Saga: New MoonÂ? Here is the ‘Wolf Pack’ from the upcoming sequel The Twilight Saga: New Moon. Unlike cold-blooded neck biters, these poster guys for animal magnetism are hot. So hot that their temperature runs a steady 108 degrees, as anyone who has read Stephenie Meyer’s series of gothic romances knows. Four actors — Chaske Spencer, Alex Meraz, Kiowa Gordon and Bronson Pelletier, all with Native American heritage — join Taylor Lautner, 17, who returns as a hairier, scarier Jacob Black. The plotline finds Jacob growing closer to a distraught Bella (Kristen Stewart) after her vampire beau, Edward, runs off. You know that these guys being shirtless throughout the movie will raise squeals from the teenage girls. The producers of this film obviously know their audience. But wait, I thought werewolves were hairy! As the hot new 'Breaking Dawn' image spreads around the Web, take a look at our favorite all-time 'Twilight' sneak peeks. "It's one of the most anticipated scenes," said "Breaking Dawn" director Bill Condon. Perhaps. More accurately, though, when it comes to Edward and Bella's first night together as a married couple, we'd say Twi-fans are consumed not with anticipation but mouth-foaming, break-out-in-a-cold-sweat madness. And the first-look photo that Entertainment Weekly has just released is only a temporary cure. The pic shows Robert Pattinson's Edward and Kristen Stewart's Bella in bed following their marriage, each one baring some skin — though the image is strictly PG-13 stuff. "I spent a tremendous amount of time thinking about it," Condon said of the scene. "The anticipation is part of it and you want to play with what people expect and maybe subvert it a little and surprise them." One thing that's not surprising is the way Summit Entertainment has consistently served the "Twilight" audience with juicy sneak peeks since production on the first film began. If you can pry your eyes away from that new photo for a few minutes, check out some of our other favorite first-looks from the vampire franchise. Photos of Edward & Bella's moments in bed together. In Stephenie Meyer's book, Jacob Black is a 6-foot-7-inch 16-year-old. In the adaptation, which began filming early in 2008, Black was played by a then-largely unknown, 5-foot-9-inch 16-year-old named Taylor Lautner. MTV News delivered the first-ever look at Lautner in wig-rocking character in April of that year. "The wig is very interesting. I'm definitely going to have to get used to it," he told us. "It's like halfway down my back." The first-ever poster promoting "Twilight" arrived in May of 2008 and showed golden-eyed Edward floating over Bella, who has a look on her face that seems to say, "Who cares if this is forbidden love?" Shot by a then-18-year-old photographer named Joey Lawrence, the poster features a tagline that reads, "When you can live forever, what do you live for?" The first official look at "New Moon" debuted the Quileute werewolves: Chaske Spencer, Alex Meraz, Kiowa Gordon and Bronson Pelletier. Conspicuously absent was Lautner. The actors, director Chris Weitz said, "went through wolf camp together, and they are in constant training. It paid off as a bonding thing for them and helped them to get to know one another. They drove each other to get more buff." Months before "New Moon" introduced the powerful bloodsuckers known as first official "New Moon" footage arrived courtesy of MTV. During the 2009's Movie Awards, we debuted the first trailer. Who did the unleashing? Pattinson, Stewart and Lautner, of course. Released in May of 2010, the first "Eclipse" teaser gave fans everything they could have hoped for: Pattinson and Stewart together in bed, Lautner without his shirt on and a little bit of acrobatic vampire action. "Isabella Swan, I promise to love you every moment forever," Edward soberly announced in the promo. The first official look at "Breaking Dawn" was a doozy: a shot of Bella clutching a handful of feathers. It was a small peek at the aftermath of her first sexual encounter with Edward. The photo's simplicity and its reference to such a momentous scene had fans going crazy. As a typical commenter put it, "FEATHERS!! I cannot WAIT!!" So what's your favorite "Twilight Saga" first-look moment? Tell us in the comments. Kiowa Gordon tweeted that he is filming on The Projectionist, which is a film shooting in New York City. Kiowa is featured on the movie’s official site here. He’ll be playing Private Locklear. The film’s synopsis is yet to be revealed. Taylor Lautner is sleeping in style! The Breaking Dawn star is shooting the final two Twilight installments with Robert Pattinson and Kristen Stewart in the Canadian wilderness. But even though it’s a far cry from his LA digs, Taylor is staying at the Executive Suites Hotel & Resort, which boasts breathtaking views.A source tells us that Taylor and the other major cast members like Ashley Greene, Chaske Spencer and other wolfpack members are staying at the hotel. Our source adds that you can catch them in the fitness center, at Rockwell’s restaurant (K-Stew and Rob’s date night spot) which is connected to the hotel, and sometimes in the pool at night! The hotel website says there are studios, one and two bedroom suites that are fully equipped with kitchens, fireplaces, private balconies, and in-suite laundry facilities! Even though our favorite stars are filming until mid-April, at least they’re doing it in Hollywood style. New Picture Of Gil Birmingham, Alex Meraz, Kiowa Gordon, Alex Rice, Chaske Spencer, Bronson Pelletier, and Tyson Houseman! Kiowa Gordon, Tinsel Korey, & Bronson Pelletier party in Vegas! I love it when pack members go to Vegas, don't you? 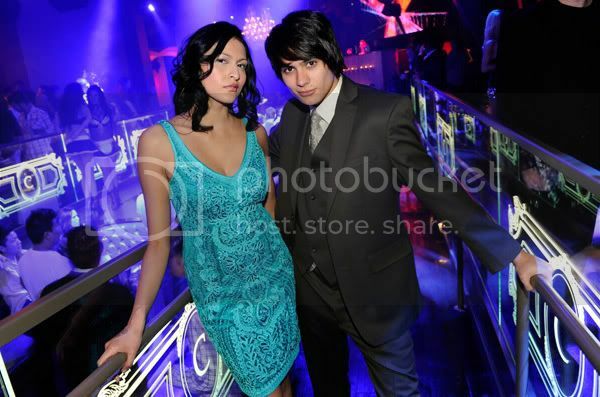 Here are Kiowa Gordon, Tinsel Korey, and Bronson Pelletier partying at the Chateau Nightclub in Las Vegas on March 26, 2011. Kiowa and Tinsel were celebrating their birthdays - and looking damn fine doing it! From Sarah Jessica Parker to Aretha Franklin (as Questlove tweeted to her, "#HappyBdayAreatha she is the Queen PERIOD") today was chock-full of celebrity birthdays. Among the many stars celebrating their March 25th births was Katherine McPhee, who received plenty of Twitter love, including from actress Ashley Madekwe, who posted, "@katharinemcphee Happy Birthday lovely! xo." Katherine, who turned 27 today, wrote, "Thk u to everyone makin me feel real special! Love birthdays! & Love u all!" There was also some b-day love for Aly Michalka, including a tweet from her sis AJ Michalka, who told her, "Happy 22nd Birthday to my unbelievable sister...I could not love you more Aly..."
In addition to all these, there's also a "Twilight"-related birthday today! Kiowa Gordon, or as he's better known to Twi-hards, Embry Call, turned 21 and got a whole lot of well-wishes on the social networking site. It seems Kiowa (pictured) and his co-star Tinsel Korey were taking the wolf pack to Las Vegas for some celebrations, when she shared, "Happy 21st Birthday Precious!!! @Circakigordon See you tomorrow!!! #KGTKVegas2011BdayWknd." Here's hoping they run into "The Hangover" wolf pack! Check out the rest of Friday's best tweets from the stars, including actor Jesse Tyler Ferguson's trip to this week's biggest celeb hot spot: the Wizarding World of Harry Potter! Follow us @hollywoodcrush to get even more celebrity and pop culture news around the clock! @sammihanratty1 It's Friday Friday gonna get down on Friday! Partyin, partyin, yeah! Partyin, partyin, yeah! Fun fun fun fun, lookin forward to the weekend! @blakelewis What did you guys think of the results last night on #americanidol ??? I'm glad they saved Casey! @mdoolittle Really America? Casey Abrams?!?! Really? I can't even talk to you right now. @elizberkeley Being at NBC this morning reminded me of my #SavedByTheBell days. So much history in those halls! @jessetyler Off to Harry Potter World in Orlando. We'll toast @Nolan_Gould with a butter beer! @nolan_gould @jessetyler I am stuck in school. Why are you so mean to me? JK. Have a good time. I have never been there. Get some booger jelly beans. @adammshankman I didn't ruin hairspray,and I wont ruin #rockofagesmovie bway fans! Sit back and enjoy. Happy Birthday to Tinsel Korey, Lee Pace, and Kiowa Gordon! Today we have not one, not two, but THREE birthdays in the Twilight Saga cast today! The lovely Tinsel Korey (who we know as Emily), Lee Pace (who we’ll see as Garrett in Breaking Dawn), and Kiowa Gordon (who plays Embry) are all celebrating birthdays today! So from all of us at Twilighters Anonymous, we’d like to wish Tinsel, Lee, and Kiowa a very happy birthday today and a wonderful year to come! We can’t wait to see you all in Breaking Dawn this fall. If you’re feeling up to it, go ahead and send Tinsel a birthday greeting via Twitter here and Kiowa here (Lee does not have a Twitter). And, of course, show your love for these three wonderful actors by leaving some birthday greetings in the comments on this post. Happy Birthday to Kiowa Gordon! QWP wishes the birthday for Kiowa on this March 25, 2011!